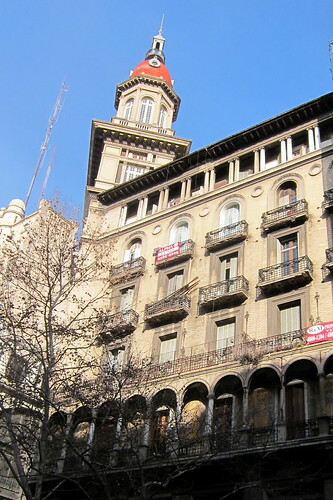 El Edificio La Inmobiliaria (The Reality Building), located at Avenida de Mayo 1408, was built in 1910 for a real estate company, La Inmobiliaria, by architect Luigi Broggi. The 9-floor, 68-meter Renaissance Revival building occupies an entire block and features distinctive red twin domes on each corner. La Inmobiliaria was formerly popularly referred to as Palacio Heinlein because the ground floor was occupied by William Heinlein.